There is never enough time in the day to get everything you want done. At least if you properly prioritize what you need to do, you can get those things done. The "must" get done. The "nice" to get done. 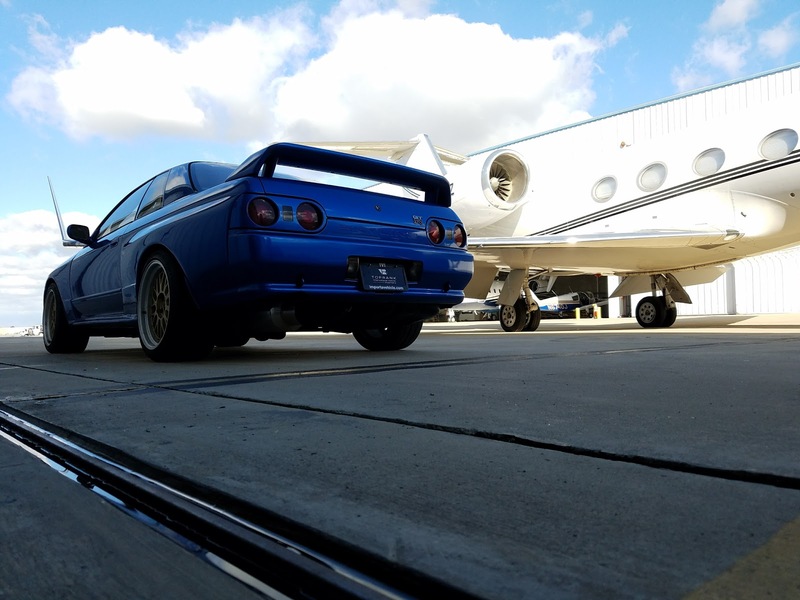 For R's Day, we are bringing this Bayside Blue R32 GT-R. It has some modifications that make it pretty well suited to a track day. We have checked it over, and it will be a good candidate. 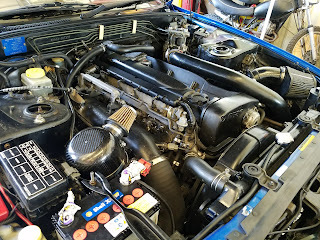 On the cooling side, the radiator is stock, but it has a Greddy/Trust oil filter relocation and oil cooler. Not a huge fan of the location, but it will work. We added some Redline Water Wetter, and burped the system. Should be GTG. AD08R onto the 18 x 10 +20 BBS wheels. Tires. 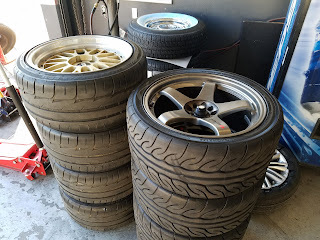 We are running Yokohama AD08R tires 265/35/18. These are a great street tire, and should provide good grip, and tire life. Especially since it looks like rain is in the cards for the event. Wheels are BBS 18 x 10 +20. One of our favorite wheels, in a great GT-R fit. Brakes. This car runs a 4 piston Brembo front caliper. The funny part is looking at it, seemed very familiar. Turns out the Stoptech ST40 is a knock off of this caliper. The same we used on the Scion tC when we raced it. So Dan at DG Spec had a ton of pads. We picked up a nearly new set of Hawk DTC60 pads. 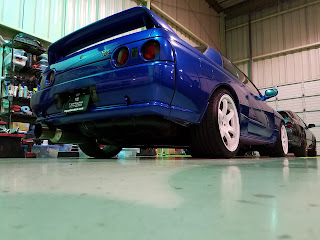 On the rear, the car has factory R34 Brembos, and looks like it has Endless or Mu pads. Stainless lines. 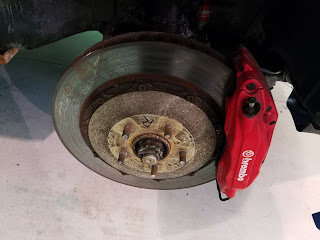 BM50 brake master (?) Fluid is Castrol SRF. We have some Vspec brake deflectors, but instead of installing them, we are writing this. Tune and engine. This car has a set of HKS turbos on it, ARC twin entry intercooler. Hard HKS inlet piping. We swapped the HKS mushroom filters for some OLD AEM dry flow filters. These are prototype one off style filters, but they fit on the ends of the Z32 MAF. The tune on this car is really good. We have boost turned down to 1.1 bar on 91 octane. Pulls strong to 9000 rpm, probably has some cams in it. This is an old NASCAR dry sump breather tank. They can be picked up on eBay very in-expensively. Had a -12 fitting on the bottom. The car had just the breather dumping on the ground. We tried another type of can first, but then the carbon tank seemed to just be the right one for the job. 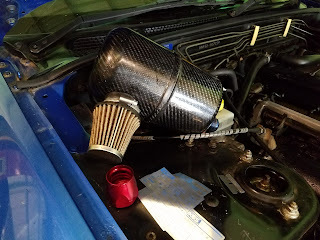 Dry carbon catch can installed. With some more time, we would clean it up a bit. Also notice Mr. Justin Bieber protecting our battery terminals. 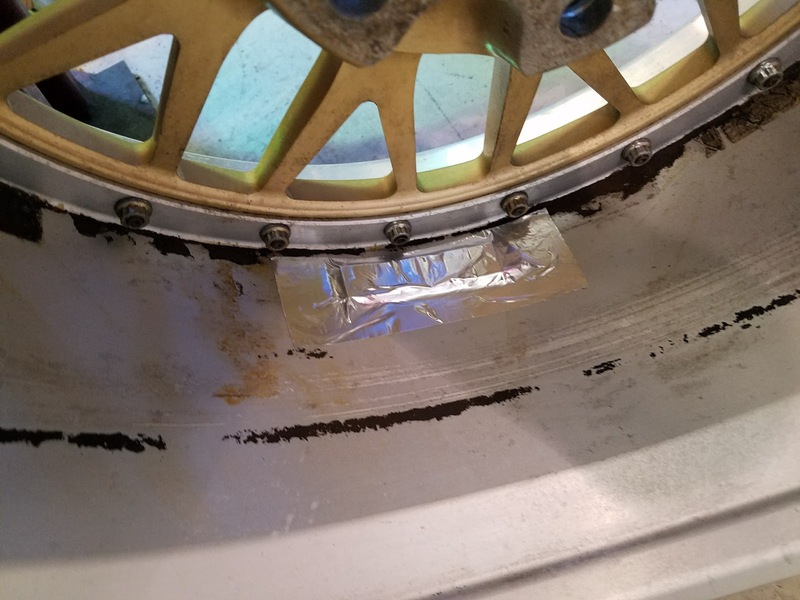 Normally of course the only one you need to cover is the negative, but we got into an argument once with a tech guy over putting tape over the negative. Not necessary, they wanted it. Easier just to do it than argue with someone that doesn't understand electricity. 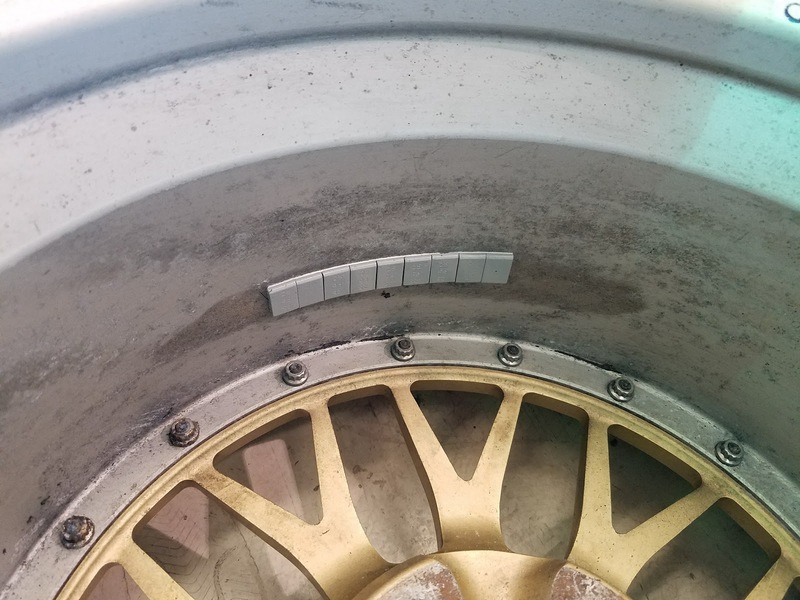 Don't forget to tape the wheel weights. The car has a Japanese roll cage setup. Nothing I am much a fan of, but it stiffens up the chassis. Suspension wise, the car is on Buddy Club coil overs, with Swift Springs. Has NISMO, and other parts in the suspension, so looks capable. Would have liked to corner balance, and string the car, but as we said in the start, only so many hours in the day. 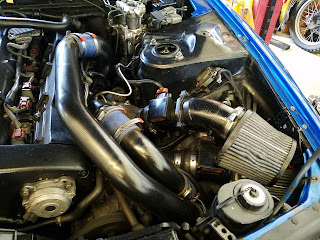 The NISMO strut tower brace isn't installed in the pics, but it is on for the event. Exhaust has a resonator and muffler. We bought a turndown, but it is not big enough to go around the muffler tip. Also too big to fit inside. Modifying that now. Getrag. 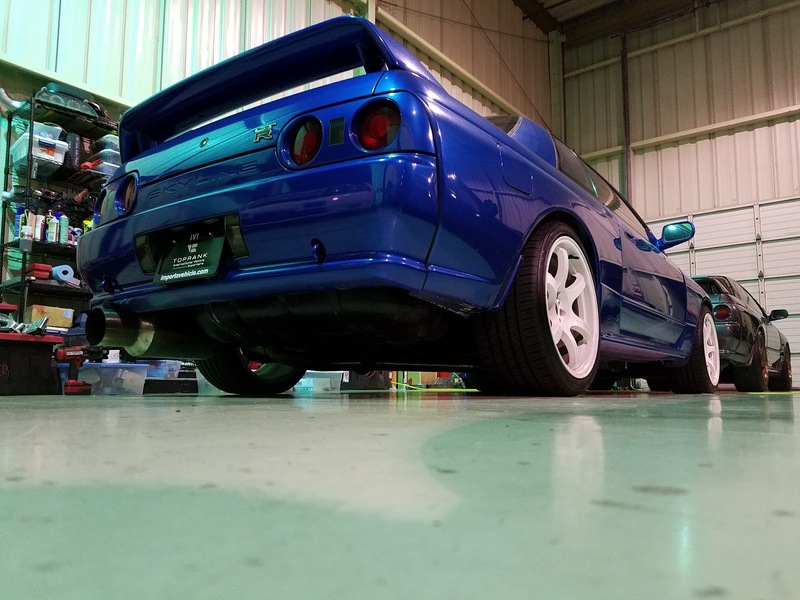 This car has a 6 speed Getrag transmission, with what feels like OEM R32/R33 4.111 gears. 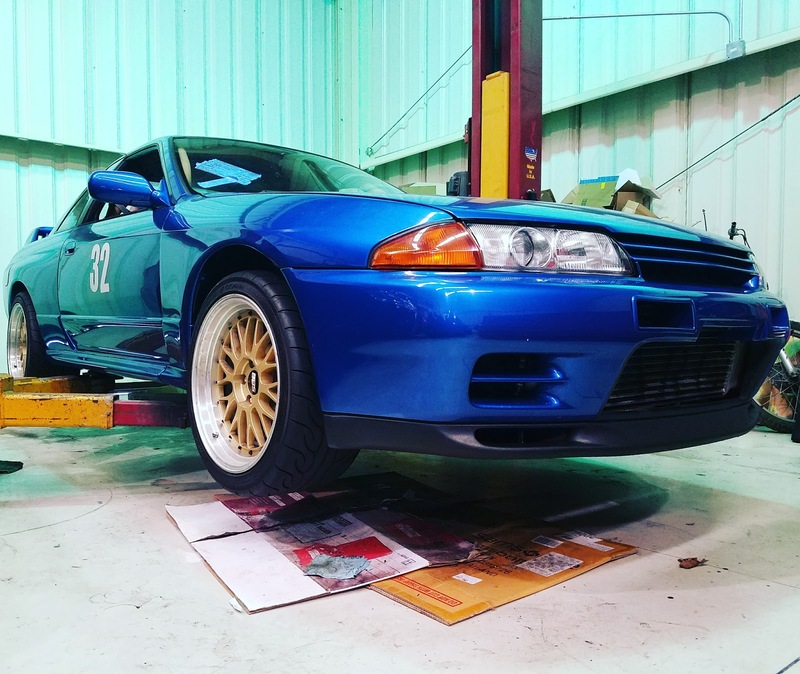 How to install a Getrag V160 into an R32/R33 GT-R.
Finishing up prep today, with Victor from Emergency Hookers Towing picking the car up on Friday. Buy USA Legal R32 Nissan Skylines at Importavehicle.com!